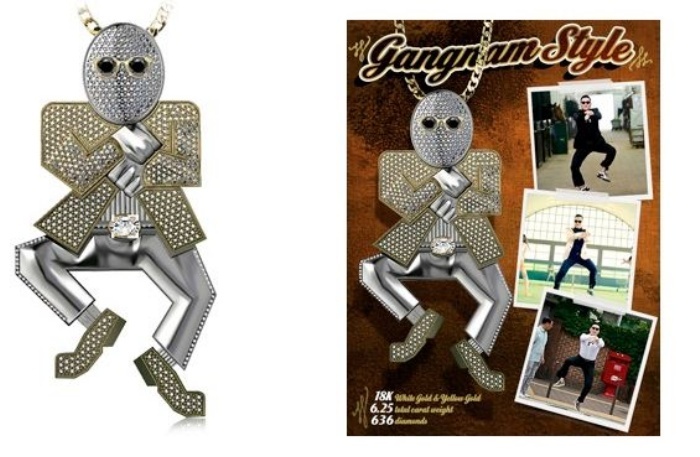 Blinged Out Gangnam Style Pendant Will Set You Back $60K | OhGizmo! By Hazel Chua on 05/22/13 • Leave a comment! Would you pay close to $60,000 for a blinged-out pendant featuring Psy in his signature Gangnam Style dance move? I wouldn’t, but some celebrity went ahead and commissioned this very expensive piece from Brilliance.com. It features 636 pieces of round and oval-cut diamonds that add up to 6.25 carats set in 18-karat white gold and yellow gold. The pendant kind of looks like an egg with glasses and a body stuck on it, but maybe that’s just me. Sixty thousand definitely seems like a ridiculous amount of money to spend on Psy and his horse dance. What say you?